Stevie Nicks has been a pivotal force in the music industry for the past few decades, and it is not hard to see why. Her moving lyrics and unmistakable voice have kept her fans entranced over and over again. She has paved the way for many young artists and inspired music and passion in their lives. Her many incarnations through Fleetwood Mac and her own solo career is something to be in awe of. She is thought to be, by a great deal of people, the reigning Queen of Rock. But of course judge for yourself. Stephanie Lynn Nicks was born to Barbara and Jess Seth Nicks on May 26, 1948 at Good Samaritan Hospital in Phoenix, AZ. Jess was a Corporate President. Barbara was a housewife and was protective of her daughter. She was kept inside much of the time, and Barbara would read fairy tales to little Stephanie. Stephanie had trouble pronouncing her name, so she called herself Stevie. At the age of four she sang country songs with her grandfather, Aaron Jess Nicks, including Goldie Hill & Red Sovine's "Are You Mine". Stevie was close to her grandfather, and he had an influence on her choosing music as a career path. AJ lived out of two trailers in the Arizona mountains. He played guitar, fiddle, and harmonica. He took freight trains all over, and was a pool shark. Stevie's brother Chris was born when she was five. Due to Jess' career changes, the family moved quite often. In 1965 Stevie was a sophomore at Arcadia High School in Los Angeles CA, where she had just joined her first band, The Changing Times, a folk outfit. Then in 1966 the family moved to Atherton CA, where she attended Menlo-Atherton High School for junior and senior years, and met Lindsey Buckingham, who was a sophomore. In the Fall of 1966, The Fritz Raybyne Memorial Band was formed, named after a fellow classmate at Menlo-Atherton High. Fritz -- Stevie, Brian Kane, Bob Aguirre, Javier Pacheco, and Lindsey Buckingham -- got their start playing current Top 40 cover tunes at dances held at their own high school. The band rehearsed in Lindsey's garage. In the early days Stevie would play guitar on her own country flavored tunes, "Where Was I", and "Funny Kind of Love". The on-stage theatricality she displayed in covering Buffy Saint Marie's "Codeine" would foreshadow later performances of "Rhiannon". Intertwining her voice with Lindsey's was fine tuned by performing renditions of Ray Charles' "Georgia". In 1968 her family moved to Chicago, and Stevie stayed behind in California. She attended Cañada Junior College in Redwood City CA for two years, and San Jose State University for three years, but quit S.J. State just short of receiving a degree in Speech Communication after five years of college. She had planned on becoming an English teacher. Instead, she transitioned into a professional musician. With the help of upstart booking agent David Forest, Fritz soon progressed from playing high school dances to playing Stanford fraternity parties, Bay Area community colleges Cañada and De Anza, and Winterland and Fillmore West. On July 12 1970, Fritz opened for Janis Joplin at the Santa Clara County Fairgrounds, and Stevie met her idol at that time. Janis would be gone three months later. In 1973 Stevie, Lindsey, Richard Dashut, and Tom Moncrieff shared a house in Los Angeles. During these lean times, Stevie worked for one day as dental assistant, was a waitress at Copper Penny, Clementine's (a Beverly Hills singles restaurant), was a hostess at Bob's Big Boy, and did housekeeping for her record producer, Keith Olsen. Lindsey did some phone sales, but mostly sat around the house practicing his guitar. Stevie's first recorded music can be heard on "Buckingham Nicks", released in 1973. Then, on New Year's Eve 1974, a fateful phone call came that would change Stevie's life forever. It was Mick Fleetwood, drummer for the band Fleetwood Mac. He had heard Stevie and Lindsey's "Frozen Love" at Sound City recording studios, and was impressed by the guitarist, a position that needed filling in his current band. Mick asked Stevie and Lindsey to join Fleetwood Mac, and no audition was required. For 15 years, from 1975 to 1990, Stevie Nicks sang lead for Fleetwood Mac. 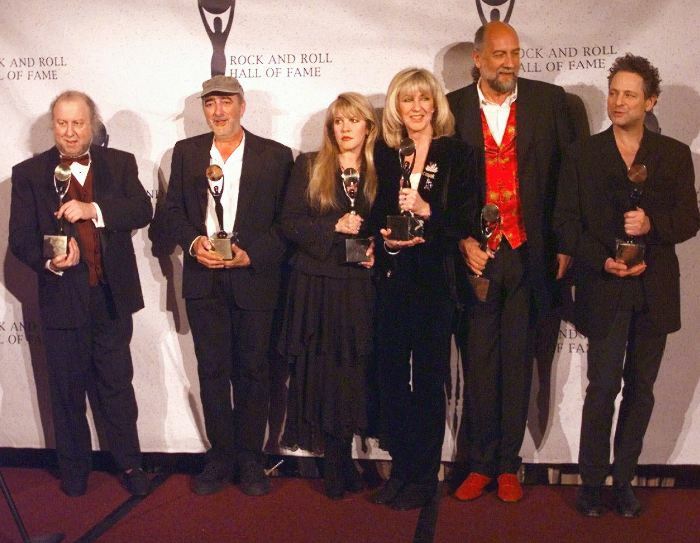 Stevie parted ways with the Fleetwood Mac from 90-97. She had left the band over a disagreement with Mick over rights to the song "Silver Springs", which she wrote intending royalties to be funneled to her mother. Mick had refused to allow Stevie to release "Silver Springs" on her 1991 Greatest Hits collection, "TimeSpace". The band reconciled for one gig, to play "Don't Stop" for President Clinton's inauguration celebration on January 19, 1993. In 1997, Stevie rejoined Fleetwood Mac for "The Dance" television special and tour. Stevie has concurrently had a successful recording and touring career as a solo act beginning in 1981, and continuing to this day.